I've been working for a couple of weeks now throwing porcelain pieces [and enjoying myself greatly],preparing mentally for the ups and downs of another round of crystal firing. I took out the old elements from the little electric kiln [the one in the picture] and replaced them with a shining new set; today,after a couple of bisc firings with the new elements,I mixed up a batch of my only 1250 degree/oxidised glaze from way back - a turquoise Barium matte that I only use for the occasional test-kiln-ful of hamsas,and glazed these 5 bottles for a cone 8 firing. I'm doing all this to try to get a protective oxidised coating on the new elements so that they won't fade so quickly when the crystal firing starts to form crystals inside the metal of the elements. Obscure practice,no? 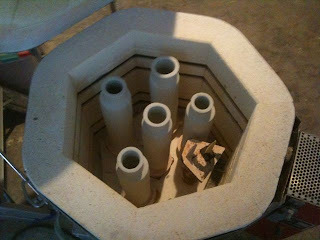 I'm also hoping that my new gas kiln will fire fast enough [while staying in oxidation] to take some of the bigger crystal pieces [sinks and tall vases]. There's no controller on the gas kiln,so the whole firing has to be done manually - but that's how I did it for 20 years or so,until the gas kiln got too old,slow and clogged for the crystal firings.